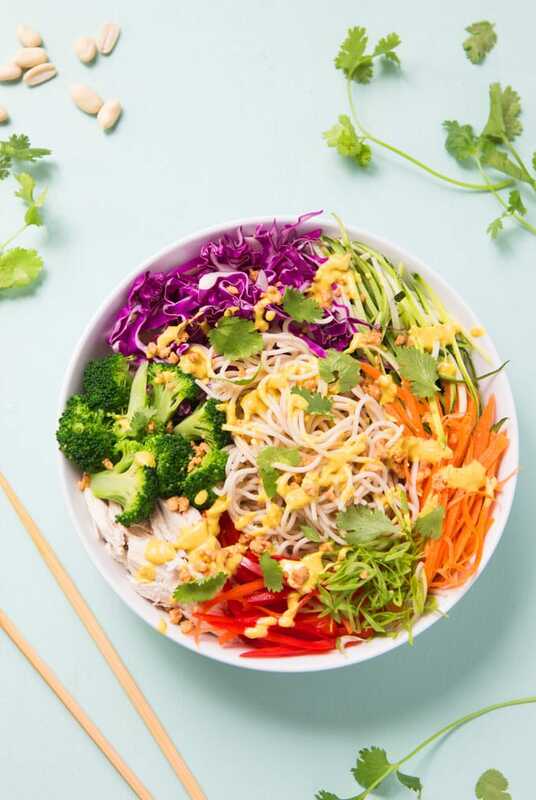 This rainbow chicken pasta salad with peanut sauce noodles is exploding with flavors and overflowing with nutritious ingredients! Although it is a chicken pasta salad , it can easily be a vegetarian and vegan pasta salad if you leave out the chicken, because the stars of this dish are all the fresh veggies and the Flavor Bomb authentic Thai Peanut Sauce! 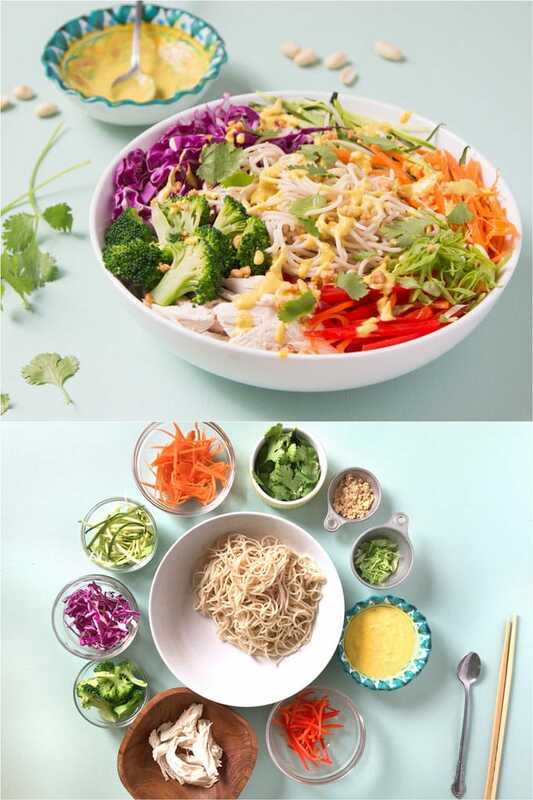 This chicken and peanut sauce noodles salad is a great meal prep recipe. All the ingredients can be made ahead and stored in the fridge for days.It can be on the table in minutes, making for a quick, delicious weeknight dinner! We used gluten free brown rice pasta. You can use any pasta or noodle in this salad. Check out the video tutorial for Gluten Free Rainbow Chicken Pasta Salad below, or skip to written tutorial next. Gluten free spaghetti pasta is definitely not required for this salad to be a success. You can use traditional wheat pasta. You can also use a thinner or thicker noodle. Follow the directions on the package to cook the pasta. Drain and let cool. The noodles can be made two to four days in advance and stored in the fridge. 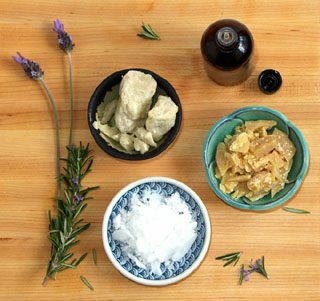 If you plan on doing this, coat them with 1-2 tbsp of oil after they are cool and drained. 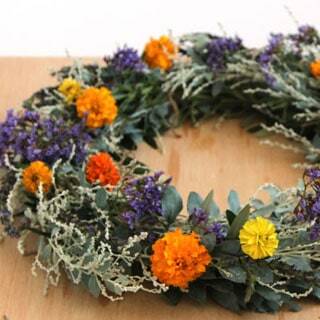 This will keep them from sticking to each other and make it easier to toss the salad when you are ready. ( Some of the helpful resources are affiliate links. Full disclosure here. ) 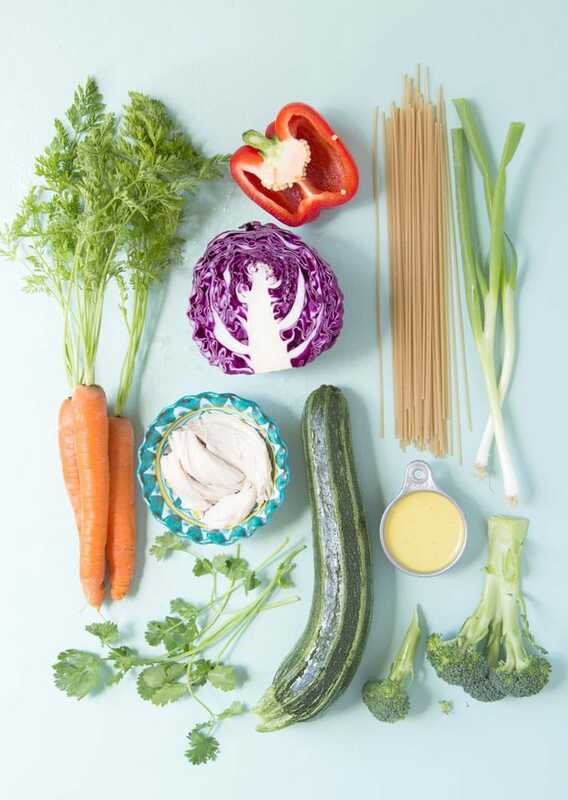 Choose seasonal veggies with a variety of colors and textures to make this chicken or vegan pasta salad extra nutritious! 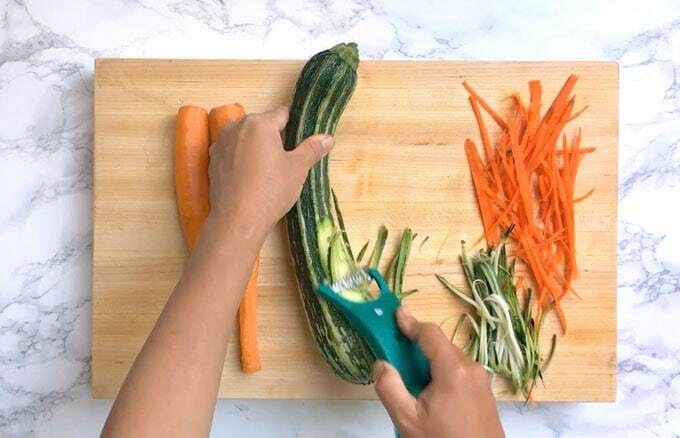 This Kuhn Rikon Dual Peeler makes julienne vegetables so quick and easy! You can use the broccoli florets raw but we like them slightly cooked. 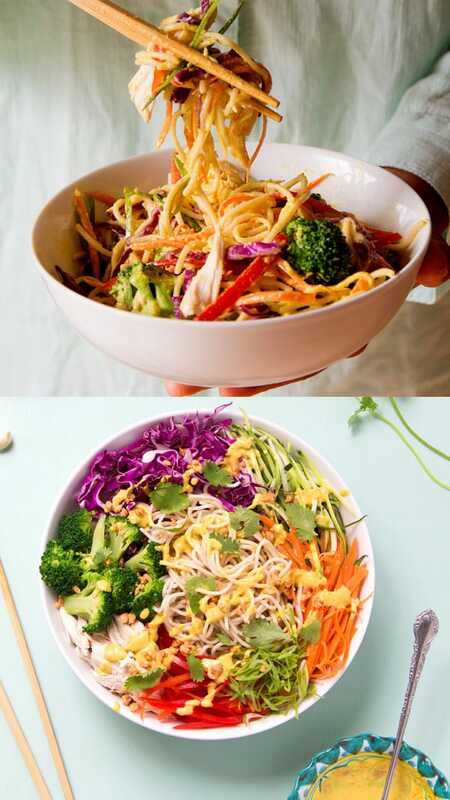 For this peanut sauce noodle salad, we blanch them in the pasta water before throwing in the brown rice pasta noodles. This is easily done by dipping them in the boiling water for 2 minutes just to tenderize them. Then take them out and place them in a bowl of cold water to stop the cooking process and keep them bright green. Drain them as soon as they are cool. The red pepper adds a nice hint of sweetness. 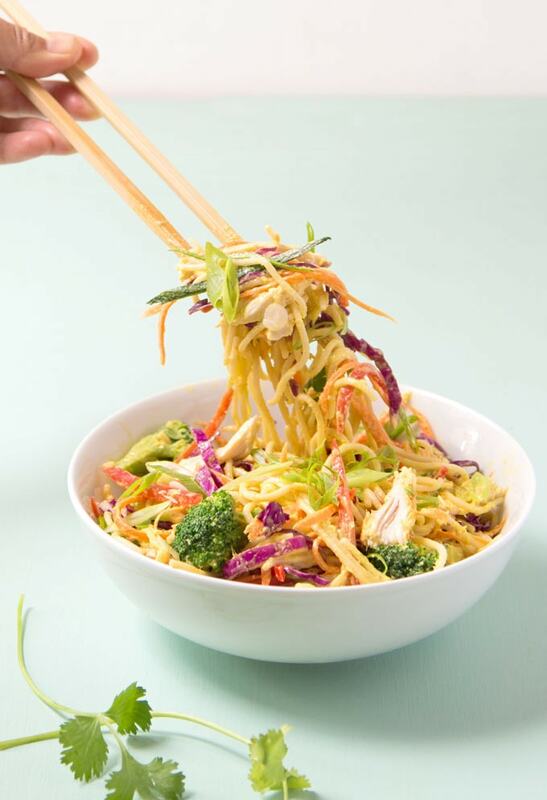 The cabbage and carrots add crunch to the peanut sauce noodle salad. We used the chicken that we cooked in our Bone Broth recipe. Cooked rotisserie chicken would also be a great choice for this chicken pasta salad, and a great way to use leftovers. Feel free to substitute a different meat if you prefer, or use baked tofu or sliced avocados for a satisfying vegan pasta salad. We love using our dangerously delicious authentic Thai Peanut Sauce as a dressing ( it is addictive, consider yourself warned ). You can use any favorite pasta salad dressing and it will taste fabulous. Toss everything together, sprinkle some cilantro and peanuts on top. Taste and see if you need a little extra salt or dressing. We serve this chicken pasta salad with lime wedges on the side. A nice squeeze of lime on top brightens up the salad. Can I use a different shape of pasta? Absolutely, feel free to mix it up for a different look. 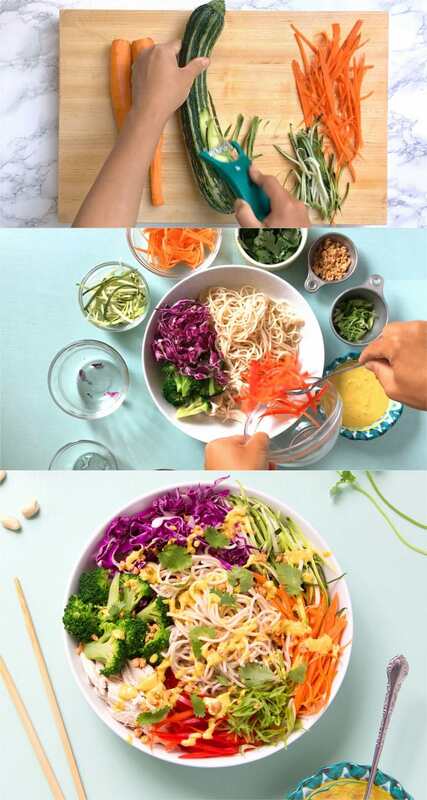 We like the playfulness of the long noodles and how they work with the long strips of vegetables in this Thai inspired peanut sauce noodle salad. What can I prepare ahead for meal prep, etc? This chicken pasta salad ( and easily vegan pasta salad ) is a great meal prep recipe. 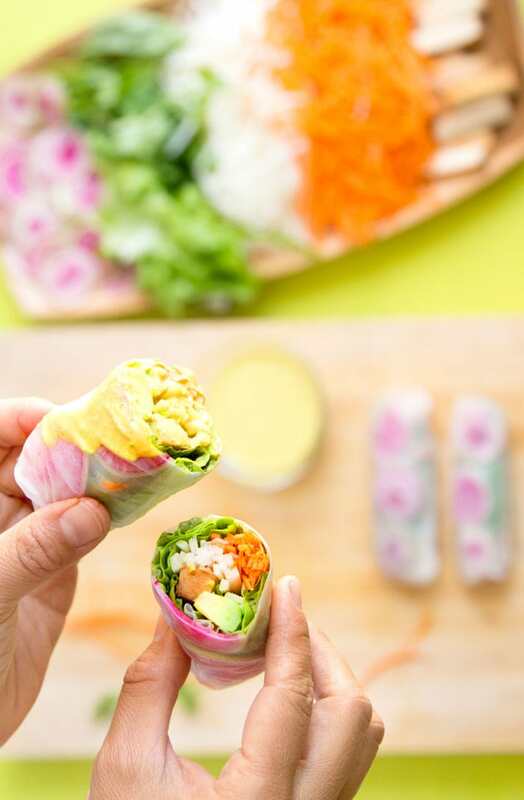 All of the ingredients can be prepared up to 4 days ahead ( if they are fresh! ) so when you are ready to eat you’ll have this salad on the table in minutes. If cooking the noodles ahead of time it is recommended that you toss the cooled noodles in about 1 tbsp of oil to prevent them from sticking to each other. Then store in the refrigerator until needed. 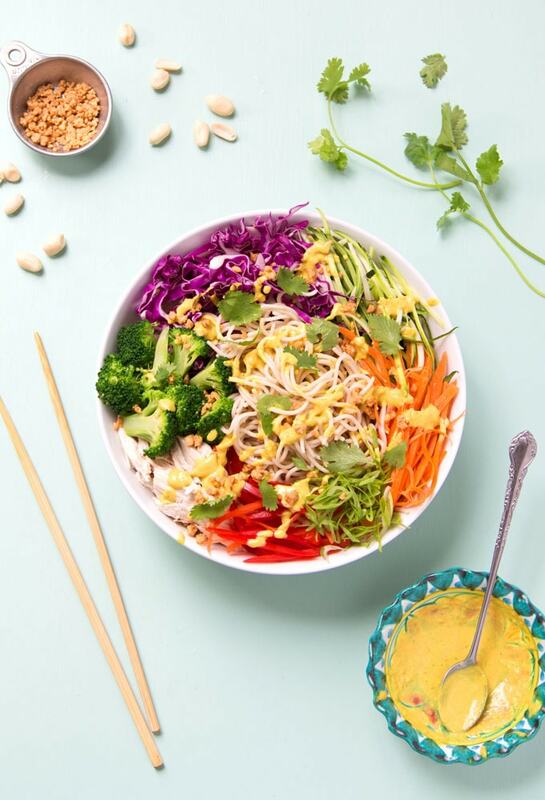 What are some other variations for this peanut sauce noodles salad? Replace the chicken with baked tofu or tempeh for a vegetarian and vegan pasta salad option. You can also prepare the salad without any chicken at all and serve it on the side with a hot piece of grilled chicken, steak, or fresh tuna. Also feel free to change up the vegetables and use what’s in season. Some ideas include snow peas, lightly cooked asparagus, and fresh corn. 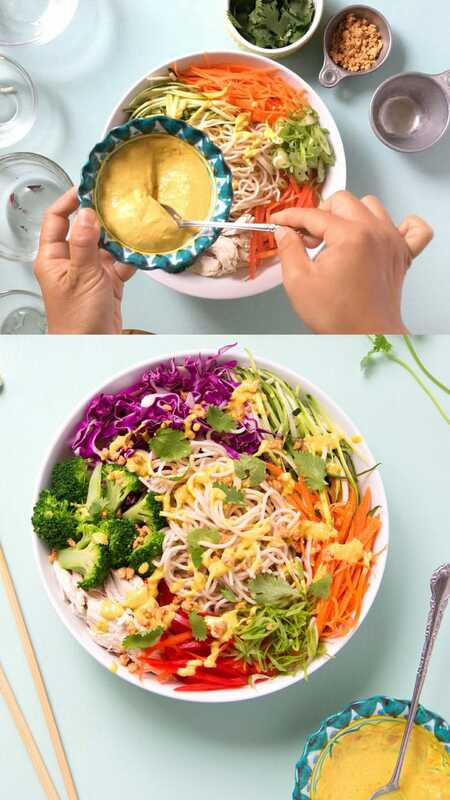 10 Minute Rainbow Chicken Pasta Salad: peanut sauce noodles packed with amazing flavors, nutritious ingredients, fresh vegetables, dressed with a dangerously addictive Flavor Bomb Thai Peanut Sauce. It's an easy weeknight dinner and great meal prep recipe with vegetarian and vegan variations. Cook the spaghetti in boiling, salted water until tender but firm. Drain and rinse with cold water to stop the cooking process. This will also wash away the excess starch. Drain well. Place all of the ingredients in a large mixing bowl except for the cilantro leaves and peanuts. Toss well and taste. You may want to add some extra salt to taste. Top with the cilantro leaves and peanuts. Serve with the lime wedges on the side. It can easily be a vegetarian and vegan pasta salad if you leave out the chicken, because the stars of this dish are all the fresh veggies and the Flavor Bomb authentic Thai Peanut Sauce! OMG this looks amazing. I love all the ingredients. I’m not good at meal prepping, but this would make a great weeknight dinner for us. Thanks for sharing. Is it possible to make a peanut sauce?! Cool! I am loving this recipe. I must cook this tomorrow. Hopefully the taste will be good. Wish me luck. Thanks for sharing this special recipe. yes we have a authentic peanut sauce recipe linked in the article!